It’s Thursday the weatherman here is predicting three days of snow. Calling for one to two feet of snow here today with high winds . But really I can’t feel too bad about it considering the folks that are having to deal with the Noreaster with rain, snow, and also high winds. My heart breaks for the people still without power knowing that people are cold and having such a tough time. It seems like it’s been a really long couple of weeks with storms, elections, relentless political ads, and then spring forward no fall back. I think Arizona and Hawaii have it right, skip over day light saving time. Tomorrow is Friday that’s a good thing I hope you have something pleasant to look forward to this weekend. I did some cooking this last week I made a crock pot lasagna from Frank Angle‘s recipe. The crock pot is a great way to cook lasagna it keeps the noodles very moist. I also cooked crock pot applesauce with cranberries the house smelled great with lots of autumn like smells. This recipe is from Joy and Nikki instead of using 12 apples I used 6 large ones and that seems like a good amount. And last but not least I made a pumpkin and bacon soup from Char this was so tasty and amazing I found myself scraping the bowl with my spoon at the end of this soup. Cooking this soup also made the house smell great. In the near future I’m hoping to make Gina’s chili and S Le’s meat pie these recipes also sounds really good for a cold weather day. Have you been cooking Fall foods? Have you found a new recipe that you love or maybe an old tried and true? If so feel free to add the recipe to the comment area or a link. I’m enjoying doing a little cold weather cooking. These are mostly non vegetarian meals. I will print links some time to some vegetarian meals as well. Or maybe just tell me what kind of foods you like to eat when the weather turns cold maybe home-made bread, soups, crock pot meals, or maybe cup cakes? I just threw that last one in to see if you were still reading. :+) Let me know how your week is going. Would you be interested in a few vegetarian recipes as well or just comfort food recipe only please. Thinking back over my life when things have been difficult and I don’t know what to say or what to do like the storms on the east coast or when friends or family are not doing well sometimes I cook. I remember when my best friends father was diagnosed with cancer I showed up with a potato dumping soup and cranberry bread and a large silk flower. I really didn’t know what to say or what to do I just felt so frustrated so I just I cooked instead. I felt so helpless. Not to end on a sad note I was just thinking about comfort foods in general. What kinds of foods do you think of when you think of comfort foods? Oh I could write a whole blog on fall foods, and probably will. Turkey soup with stuffing dumplings was something I invented last year. OH was that good. The thing I look forward to more than anything is cornbread stuffing at Thanksgiving. I’m off to write it. I remembered a funny T-day story or two to go along with it. Oh Good I Love your family stories! :+) I can’t wait to read your post. My wife claims in her single days she was a crock pot fanatic. She has yet to make a damn thing for me in it. Well…I’d say show her this post maybe she will be inspired to dust off the ol croc pot. :+) I’m fairly new to croc pot cooking. I’m surprised at all the different things you can cook in them. I wish I would have known about crock pot cooking when I was single it’s a nice time saver too. I’m going to try that applesauce with the rest of my apples that I’ve been too lazy to do anything else with after drying a bunch. I love cranberries, so that was a nice twist. And it looked really easy (which I need after this crazy week). Thank, Starla. Thanks for posting all of these. You were ambitious to try so many new recipes. I usually feel good if I do one a month. My pleasure I think I missed cooking over the summer time I kept things pretty simple. It was hot summer so I didn’t want to heat the house up too much. Now I’m thinking about the croc pot recipes that might have been the way to go. It got cold here (well relatively) for a couple days and we made chicken soup. Supposed to go right back to 70 by the weekend though. Oh…enjoy that nice weather for me! :+) I think our 70’s is over for awhile. 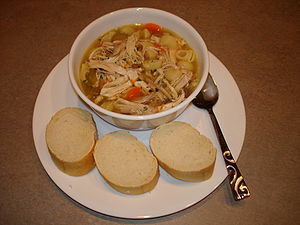 Chicken soup is a really nice comfort food and so good for too. Good food can be good in many ways and be used for good in many situations. That crock pot applesauce with cranberries sounds great. Enjoy it and enjoy the weekend. Thank You Otto :+) Tha applesauce was very good The cranberries were a nice addition. I think I will be probably be making this recipe again soon. We have been having some cold single digit weather so warm meals are. nice. OK now I’m drooling. Michelle made Lasagne on the weekend & it was soooo good. She always uses the crock pot for casseroles & I love the way the slow cooking makes the meat so beautiful & tender. I haven’t really made casseroles in the croc pot I know that’s really what they are made for. Now you have me drooling! :+) I’m going to have to experiment around with recipes. I read the book “Tuesdays with Morrie” I remember really enjoying it I bet it was a really great play. Glad you were able to spend a little time in the mountains. Mexican food yum nice choice. :+) Welcome back from the mountains. The crock pot applesauce with cranberries should be a delicious dish to serve on a cold evening… 🙂 I think most of us would have appreciated your gesture… When families are in pain, cooking is not easy to do. I agree about families being in pain usually cooking is the last thing on your mind. Your soup looks delicious! This weekend I made: Muffins, cookie bars, chicken pie, meatload, spare ribs, and mash.